Our company is the well known manufacturer, trader, and wholesaler of Designer Pouches in eye catchy design. 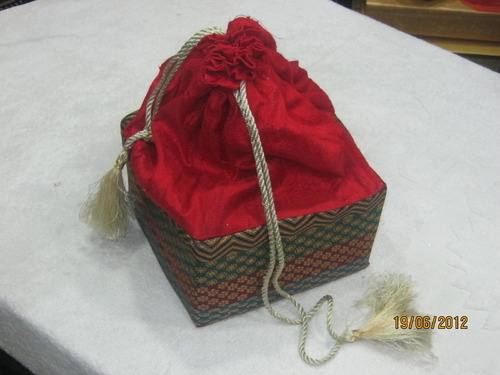 Made from quality grade fabric obtained from our trustworthy vendors, these elegant drawstring pouches are provided in different flowery patterns at the bottom. Lightweight and attractive, these pouches can be teamed up with any casual wear. Established in the year 1960, we "Kallu Box & Sons" reckoned as one of the leading manufacturer, exporter, trader & supplier of jewelry & gift boxes. The range of exclusive products offered by us includes Jewelry Boxes, Bangle Stand, Wooden Boxes, Dry Fruit Boxes & Chocolate Boxes. These products are available in variegated range of sizes & patterns and are highly demanded for their superior quality, exquisite designs and extreme durability. We offer our clients quality products at most reasonable price. For the convenience of our clients we have arranged for easy mode of payment and also provide shipment facility as specified by our clients.We also have proper warehousing facility that facilitates the safe storage of the raw material as well as manufactured products. Our organization has a diligent team of professionals who have a wide experience in this industry and assures the quality delivery of products. We export our products in Dubai and USA.